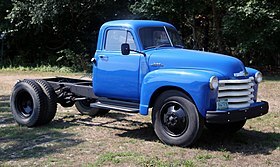 Advance-Design was a pickup truck series by Chevrolet, their first major redesign after WWII. Its GMC counterpart was the GMC New Design. It was billed as a larger, stronger, and sleeker design in comparison to the earlier AK Series. First available on Saturday June 28, 1947, these trucks were sold with various minor changes over the years until March 25, 1955, when the Task Force Series trucks replaced the aging Advance-Design model. 1947 - Gasoline tank filler neck on passenger side of bed. No vent windows in doors. Hood side emblems read "Chevrolet" with "Thriftmaster" or "Loadmaster" underneath. Serial numbers: EP ½ ton, ER ¾ ton, & ES 1 ton. Radios were first available in Chevrolet trucks as an "in dash" option on the "Advance-Design" body style. 1948 - Manual transmission shifter now mounted on column instead of floor. Serial numbers codes: FP ½ ton, FR ¾ ton, & FS 1 ton. Early 1949 - Gasoline tank now mounted upright behind seat in cab; filler neck aft of passenger door handle. New serial number codes: GP ½ ton, GR ¾ ton, & GS 1 ton. Late 1949 - Hood side emblems no longer read "Thriftmaster" or "Loadmaster", but are now numbers that designate cargo capacity: 3100 on ½ ton, 3600 on ¾ ton, 3800 on 1 ton. Serial number codes remain the same as on early 1949. 1950 - Telescopic shock absorbers replace lever-action type. Last year for driver's side cowl vent, its handle is now flat steel, not maroon knob as in previous years. New serial number codes: HP ½ ton, HR ¾ ton, & HS 1 ton. 1952 - Outer door handles are now push button type as opposed to the previous turn down style. Speedometer now reads to 90 mph and dashboard trim is painted instead of chrome. Mid-year, Chevrolet stops using the 3100-6400 designation on the hood and changes to maroon window and wiper knobs. New serial number codes: KP ½ ton, KR ¾ ton, & KS 1 ton. 1953 - Last year for the 216 in³ inline-six. Hood side emblems now only read 3100, 3600, 3800, 4400, or 6400 in large print. Door post ID plate now blue with silver letters (previous models used black with silver letters). Last year to use wooden blocks as bed supports. New serial number codes: H ½ ton, J ¾ ton, & L 1 ton. 1954 - Only year for significant design changes. Windshield now curved one-piece glass without center vertical dividing strip. Revised steering wheel. Revised dashboard. Cargo bed rails, previously angled, now horizontal. Tail lights round instead of rectangular. Grille changed from five horizontal slats to crossbar design commonly referred to as a "bull nose" grille, similar to modern Dodge truck grille. Engine now 235 in³ straight-6. Serial number codes unchanged from 1953. Hydramatic automatic transmission is available for the first time as a paid for option. ^ "Directory Index: GM Trucks and Vans/1948 Trucks and Vans/1948 Chevrolet Trucks Brochure". Oldcarbrochures.com. Retrieved November 20, 2011. ^ Bunn, Don. "Segment Five: 1947-1954 Advanced Design Pickups". Pickuptruck.com. Archived from the original on October 18, 2007. ^ "What Year is My Truck?". Classicparts.com. Retrieved February 3, 2008. ^ "Introduction to A-D factoids". 2007. Retrieved May 18, 2015. Wikimedia Commons has media related to Chevrolet Advance Design. This page was last edited on 10 March 2019, at 11:27 (UTC).